Umbrella Strollers are light, compact and a lot less expensive than full fledged travel system strollers. They’re perfect for a quick run to the local grocery store or to the kids’ playground the next block over. An umbrella stroller usually does not have advanced features such as all-terrain wheels, parent tray, a roomy storage area, car-seat or bassinet compatibility and so on. Still, the best strollers more than make for this in terms of affordability and convenience. An umbrella stroller is very much like such a small car. It is not the last word in stroller technology but you’ll be happy that you have one and will use it very often. They’re also a good option for those who are looking for a budget-friendly single stroller and also for those who already have a travel system but are looking for something light and small for shorter runs. I have compiled a list of some of the best in the market. 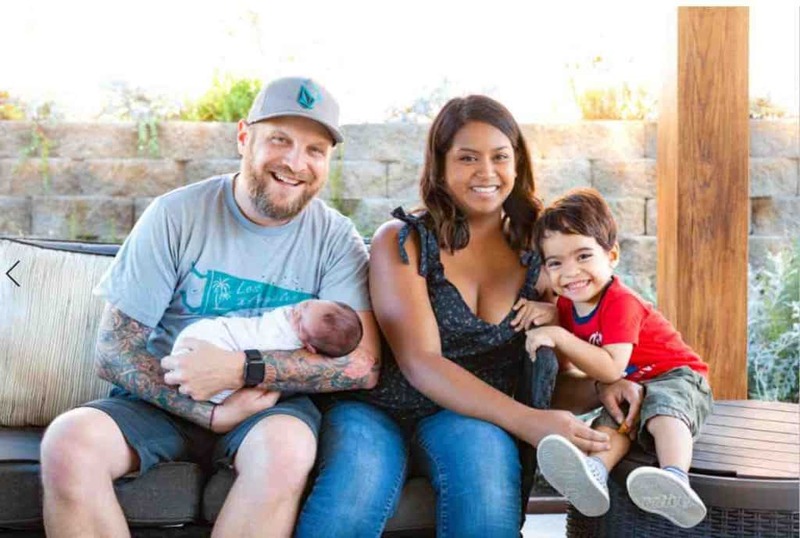 This is one of the most popular models in the US – thousands of families are using it and most of them love it. Let us find out what makes the 3D lite such a hot favorite. 1) This stroller offers a lot of features without adding weight or bulk. It has an open design with 4 position seat recline adjustment, cup holder, usable storage basket and also a separate storage pocket for parents at the back of the seat. 2) The stroller has a strong ‘airlight’ aluminum frame weighing only 13 pounds. Despite the compact design, the stroller offers a large and comfortable seat with a good amount of padding and 5 point safety harness. Accommodates up to 50 pounds. 3) The unique selling point of an umbrella stroller is that it’s light and folds easily. The 3D Lite does this rather well and also locks automatically. It also has a very smart carry strap. 4) The anti-shock front wheels do a good job of absorbing small bumps. The rear wheels are lockable, ensuring that the stroller stays in place even on sloped surfaces. 5) Has a large adjustable canopy and stylish flip-out sun visor with a 99.9% rating against harmful UVA and UVB sun-rays. 7) Really well built and durable. Honestly, there are not many downsides to this stroller. 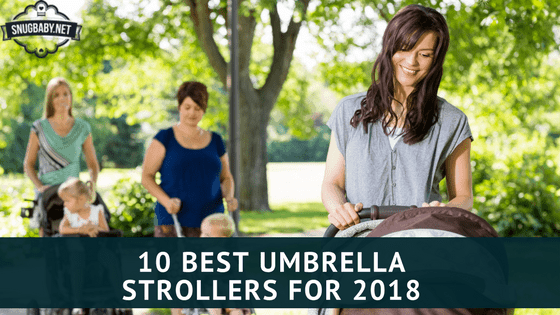 If anything – it’s slightly expensive for an umbrella stroller (around $80.00 USD, while most others on this list are around half that), but totally worth it in my honest opinion). Also, the 3-step fold mechanism is very effective but takes some getting used it. The Summer Infant 3D Lite Convenience Stroller offers unmatched practicality without compromising on too many features. Hence, it tops the SnugBaby list of the best in the USA. Also ships internationally, by the way. This is a no-nonsense, no-fuss umbrella stroller with a cute sun canopy and a surprisingly low price tag. 1) Even though it looks puny and weighs just a little over 8 pounds, this stroller can actually accommodate a child weighing up to 40 pounds. 2) Folds quickly and smoothly. Can be folded and unfolded with just one hand once you get the knack – this way you don’t have to leave your toddler unattended even for a few seconds. Fits in almost any car. 3) 3-point harness keeps child securely in place. Canopy protects against the Sun. 4) The stroller can be used for children up-to 3-4 years old. This makes it a phenomenal value for money proposition. 1) Really bare-bones. Not even a small storage area. Cup holder? What cup holder? 2) Handles are a bit low. Can be uncomfortable for taller people as they’ll have to hunch forward and push at the same time. Height is 35.75 inches. 3) Wheels are not exactly eager to turn. No shoulder straps. The Disney Umbrella Stroller is an open-it, use-it, shut-it and forget-it transporter. It works well for short distances. It is not perfect by any stretch of the imagination – nor does it claim to be! This stroller is more than just a fancy name. It has a lot of things going for it. For starters, it is built according to ASTN standards and is JPMA certified. (Juvenile Products Manufacturers Association). It makes use of durable materials and comes with a 90 day limited manufacturer warranty. 1) Weighs just a hint under 10 pounds but can hold a child weighing up to 40 pounds. 2) Features a removable parent-pouch that can be used to store stuff like treats, keys, phone, books etc. 3) The padded seat is lined with nylon mesh. The seat can be rolled up to create a comfortable headrest/pillow. This arrangement also improves air circulation and keeps your kid cool on hot days. 4) Stylish extendable canopy with visor shields against harsh sunlight. 3 point safety harness keeps the occupant secure. 5) Compact and hassle-free umbrella fold is very handy while traveling. The stroller also has a storage basket for essential supplies. 6) 5.5 inch front and back wheels along with front suspension offer a smoother and fairly comfortable ride as long as you use it on reasonable surfaces. 7) Ergonomic handle along with a cup-holder for parents. Height is 40 inches from the ground – the caregiver does not have to hunch forward while steering (unless it’s a tall person). 1) Strangely, the manufacturer recommended age for this stroller is 9 months and above – this is a little high. 2) The back has very little scope for adjustment and hence the stroller is suitable only for a child who is able to sit up straight independently. Except for this inconvenience, the North Star impresses with a long list of features and reasonable price tag. This stroller looks like its straight from an animated movie. If nothing else, it will obviously get your kids super excited about going out. In fact, even I felt like jumping in and ‘riding the monster’ when I first saw it! Fortunately, my wife stopped me before I made it in! 1) It’s affordable and has a cool design. Other kids will be straining their necks trying to get a good look at it. 2) Heavy duty 3-point harness for a safe ride and a monster-head canopy for Sun protection. There’s also a footrest to ensure that your kid has a relatively comfortable ride. 3) The stroller weighs just 7.3 pounds and accommodates a child weighing up to 40 pounds. 4) Very easy to assemble. Just attach the front wheels to the frame and you’re good to go. Takes up next to no space when folded – can be stored easily in even small hatchbacks. 5) International Shipping available in select countries. 6) Step-on brakes ensure that the stroller stays in place even on slopes. 1) Meant strictly for short rides. 3) No storage basket. Seat does not recline. Overall, the Cosco Monster Elliot umbrella stroller is a good choice for traveling and going to the ice-cream parlor a block or 3 from your home. It also works pretty well as a spare stroller at Grandma’s or the babysitter’s place. It has absolutely no creature comforts but still, you get more than what you pay for. Most umbrella stroller look just the same – this one gets brownie points for having some pizzazz. If you’re in the market for a stroller that offers the convenience of an umbrella stroller but still retains a few features of top end models, then this is the stroller for you. It has a contemporary European design with larger wheels for better steering and ride quality. Even better, the stroller is JPMA certified and crafted in accordance with the latest industry standards. 1) The seat has a good amount of shoulder padding and comes with a 5 point safety harness and multi-position recline adjustment. This ensures that the occupant has a safe and comfortable ride. The safety harness and piping feature reflective surfaces to make the stroller more visible at night. 2) The handles are high enough (43 inches) and hence, even taller caregivers will not have to hunch forward awkwardly while operating the stroller. The handles can be rotated to 8 different positions according to the preference of the caregiver. 3) Folds easily and has a convenient auto-lock feature, making it a breeze to transport. Folded dimensions are 11.8 x 11.6 x 42.1 inches. 4) The stroller has a stylish Sun visor and offers lots of storage areas – a large basket under the seat, a detachable side pocket, a rear canopy bag and even a cup holder for the parent. 5) 6 inch rear and 5 inch front wheels make it easy to navigate bumpy areas. Rear wheels can be locked in place via step brakes. 6) High quality steel tubing and durable fabrics allow this stroller to hold a baby weighing up to 45 pounds. 7) This is a well engineered product. Does not feel ‘cheap’ like many other umbrella strollers. 8) Can be assembled easily without the need for any tools. 1) Its almost twice as heavy as other no-frills umbrella strollers. 16 pounds to be exact. 2) Not compatible with infant car seats. Cannot be used as part of a complete travel system. The J Is For Jeep Brand Scout Stroller is a quality product at a competitive price. Infant seat compatibility would have made it almost perfect. The tall handle position, decent sized wheels, comfortable seating and plenty of storage options make it usable even for longer walks. Weighing just a shade over 9 pounds, this umbrella stroller by Kolcraft is made for travel, picnics, one-day outings as well as short trips around the house. In addition to a compact fold, this stroller also packs a host of features to make the ride safe and enjoyable. 1) The stroller has a usable storage basket that is accessible from the rear. 2) The padded back-rest of the seat can be folded to expose a strong mesh lining. The rolled up padding creates a comfy head-rest for the baby while the mesh helps to improve air circulation on very hot days. 3) In many umbrella strollers, the canopy is rather small and ineffective against the sun. The Cloud however, has a fairly large and extendable canopy that does indeed do a great job of shielding against harmful UV Sun-rays. 4) Comes with fairly high foam-handles and a parent cup holder. 5) Has a three-point safety harness to keep the baby secure at all times. JPMA certified. Can hold a child weighing 40 pounds or less. Shocking-absorbing front swivel wheels prevent sudden jerks and account for a smooth ride (by umbrella stroller standards). 6) The stroller folds compactly in one clean motion for easy storage in your closet or car. Folded dimensions are 10 x 9.5 x 42.5 inches. 1) Seat does not recline. 2) Awkward ergonomics (especially for taller people). Several tall users have reported that they’re unable to push the stroller without kicking the rear wheels. All-in-all, The Kolcraft Cloud Umbrella Stroller is as light as a cloud and also provides respite from the jarring Sun. It’s available in three attractive colors: sparkling red, spring green and black. The Kocraft Cloud LightWeight Stroller (number 6 on our list) is a fairly good stroller considering its price point. However, many parents don’t mind shelling out a few extra bucks in exchange for somef key features to make life easier. This stroller does everything that the Kolcraft Cloud, PLUS a lot more! At 11.8 pounds, it’s only two pounds heavier than the basic Cloud. 1) The Cloud Plus features a foam-padded handle bar complete with a small storage tray and two cup-holders for parents. 2) Has a large, three-tier extendable canopy to protect against damaging UV Sun-rays. There’s also a peek-a-boo window so that you can keep a watch on your baby. 3) Folds with one hand and stands on its own so you don’t have to leave the baby unattended even for a few seconds. Folded dimensions: 18x12x34 inches. (Note: The folding and locking mechanism can be tricky a times and take some getting used to). 4) Comfortable seat with multi-position recline adjustment. Can accommodate a child weighing 50 pounds or less. Heavy duty 5-point safety restraint system keeps baby safe and secure at all times. 5) Has a removable child tray with dual cup and box holder for easy feeding. A roomy storage basket is located underneath the seat. 6) All-terrain wheels with front suspension provide a plush ride. 7) This stroller is JPMA certified and comes with a one year manufacturer warranty. Nothing really. General fit and finish could have been better. Also, just like most other umbrella strollers, this one is a bit low and tall people will not enjoy pushing it for longer trips. The Cloud Plus by Kolcraft is a great little umbrella stroller with all the features of a full-blown travel system. This model has the potential to function as a primary stroller but it is not compatible with bassinets and car seats. One year warranty makes it a really sweet deal. This is a very basic umbrella stroller. In fact, let’s just call it an umbrella with four wheels. Nobody’s complaining about the price though! 1) It’s unquestionably light at just 8.8 pounds and yet it can carry up to 40 pounds. 2) Folds easily and has an adjustable canopy. 3) Has a three-point harness to hold baby in place. 4) Covered handled provide a secure grip. Step-on brakes facilitate easy stopping. 5) The stroller has a durable frame and it is very easy to assemble. You don’t need to bring out your entire toolbox to assemble it. Just attach the front wheels to the frame and you’re ready to go. 1) No storage area whatsoever. Does not have even a small storage pouch. 2) The three-point safety harness lacks shoulder straps. Hence, the seat is suitable only for those kids who’re able to sit up on their own. 3) The seat does not recline even a little bit. 4) Handles bars are low. This makes it difficult to push the stroller for longer periods of time. 5) Overall fit and finish is a bit iffy. Wheels tend to go sideways at times. 6) Sun canopy is rather small and does not provide adequate coverage. The Cosco Umbrella stroller is suitable for short trips only. However, to its credit – it does not make any tall claims. It’s not perfect but it goes about its job with a smile. 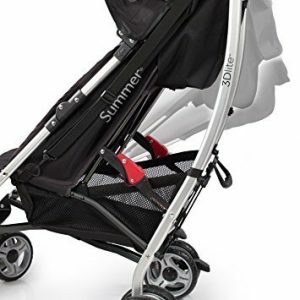 The 3D-one by Summer Infant is a premium umbrella stroller that ticks most boxes and punches way above its weight. It can give most full-size strollers a run for their money. 1) Even though heavier than the average umbrella stroller, it is still fairly light at just 16 pounds. Can accommodate a baby weighing up to 50 pounds. 2) Features an extra large extendable Sun canopy to shield against 99.9% of UVA and UVB rays. Peek-a-boo window allows the parent to interact with the baby and also keep a close watch. 3) Very comfortable seat can be reclined to multiple positions. The 5-point safety harness keeps the occupant strapped securely in place. The adjustable footrest enables the stroller to accommodate children of various sizes while maintaining good ergonomics. 4) The seat, footrest and canopy can be adjusted with just one hand. The stroller can be folded quickly with …you guessed it…one hand only! Stroller locks automatically and features a convenient carry strap. Stands on its own too! The 3D-One is expensive but it’s also one hell of a convenient stroller. The only real downside is that it’s larger than other basic models such as the Cosco Umbrella Stroller (Number 8 on our list). I suggest that you go ahead and buy this umbrella stroller as long as budget is not a constraint. The seat reclines almost completely flat and there are no gaps. This means that babies can sleep in it (even on their side) during long lay-overs at airports. This stroller is certified ‘frustration-free’. And no, I am not making this up. That’s a manufacturer claim! This is a top-of-the-line convenience stroller that offers most of the features of full-sized strollers along the compactness and lightness of an umbrella stroller. 1) Adjustable canopy with Sun visor protect baby from bright Sunshine – even if it is coming in at a sharp angle. The seat can be set to multiple positions according to the preference of the baby. 2) 5 point safety harness system with padded shoulder straps ensures that the baby stays comfortable and safe even on bumpy surfaces. The seat-belt and piping feature reflective material to improve visibility at night. 3) The stroller weighs 16.1 pounds. It can accommodate a kit weighing 45 pounds or less, thanks to its durable steel frame. 4) The stroller is JPMA certified and meets or exceeds all pertinent industry standards. 5) The 7 inch rear and 6 inch front wheels enable it to navigate all kinds of terrain. This one’s ready to go out and about and more than justifies its name – The Scout. 6) Compact umbrella fold with autolock ensures that it can be stowed away easily when not required. Folded dimensions are 11.8 x 11.6 x 42.1 inches. 7) It’s priced really well considering the features on offer: roomy storage basket, step brake, 8-position adjustable handlebars, parent cup-holder, removable side pocket and a rear canopy bag. I tried to be really picky and found just one negative: There’s no parent and child-tray. The Scout looks good and rides smooth. It’s safe, convenient and pocket-friendly without being fiddly or boring. This is a wescll rounded package that’s suitable even for longer trips. Recommended! I hope that you’re now equipped with the all the info that you need to take on the summer! Please post your feedback in the comments section below. I and many other parents are eager to find out which umbrella stroller did you choose and why? Didn’t find what you need? We have TONS of other stroller reviews on SnugBaby.net, click here to check out our other stroller reviews.